Imagine a single vaccine that could protect you from all flu strains for decades. 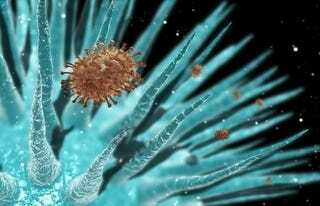 It looks like we might actually make it a reality in the near future, thanks to a major breakthrough in combating the rapidly mutating disease. Because flu strains change so quickly, vaccines have limited effectiveness and need to be reformulated annually. As such, a universal flu vaccine that could take of all known (and, with any luck, a few unknown) flu strains would be a huge boon for immunology. New experiments with mice, ferrets, and monkeys were able to produce antibodies that attacked a vast array of different influenza viruses. "Generating broadly neutralizing antibodies to multiple strains of influenza in animals through vaccination is an important milestone in the quest for a universal influenza vaccine. This significant advance lays the groundwork for the development of a vaccine to provide long-lasting protection against any strain of influenza. A durable and effective universal influenza vaccine would have enormous ramifications for the control of influenza, a disease that claims an estimated 250,000 to 500,000 lives annually, including an average of 36,000 in the United States." The key to this achievement lay in altering what the immune system's antibodies target. The experimenters targeted the flu virus hemagglutinin surface protein, or HA. Using this protein as the basis of a DNA vaccine, they were able to create a broad-based response to many different types of influenza. The key was altering what the antibodies target. In the normal course of things, they would try to identify the "head" of the hemagglutinin, which in the strain they used looks like a bit like a lollipop. However, the head is able to constantly mutate, which is what makes flues so impossible to vaccinate against. Instead, they targeted the "stem" of the protein, which barely changes between different strains. As such, successfully vaccinating against one hemagglutinin stem should mean vaccinating against any such stem, and with that comes the possibility of a universal flu vaccine.